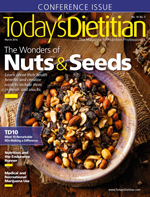 Today's Dietitian helps your business grow by offering you the opportunity to purchase reprints of articles or departments found in the magazine, or link to the article from your Web site. Share them with clients, colleagues, patients, and students. They're also great for your sales force and tradeshow handouts! Simply select an article below and e-mail us or call 877-652-5295 for more details. 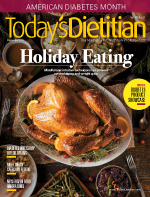 Enjoy an in-depth look at some of the holiday's most healthful choices that can lower chronic disease risk. Learn what the new American Heart Association guidelines say and the strategies for counseling patients. Food manufacturers are harnessing the protein in peas to introduce nondairy milks and faux meats to meet consumer demand for more healthful products. Scientific research on the health benefits of herbal teas is slowly catching up with their growing popularity. The second in a two-part series, this article spotlights several dietary approaches that research suggests may improve symptom management and outcomes in cancer patients. This continuing education course explores the impact of vitamin D on the immune system, explains the role of vitamin D in autoimmunity, and discusses the importance of vitamin D on specific autoimmune diseases based on the latest research. Mindful and intuitive techniques can prevent overindulging and weight gain while increasing enjoyment. Today's Dietitian provides basic training for RDs about the pathophysiology of type 2 diabetes and the role medications play in managing the disease. Move over pretzels and chips. Sales in the evolving meat snack category are rising as new, innovative, more healthful offerings hit store shelves. Food companies are introducing entrées made with fruits, vegetables, and whole grains, and fewer artificial ingredients and preservatives to meet consumer demand for healthful frozen fare. The first in a two-part series, learn about the special nutrition needs of patients and strategies for symptom management. This continuing education course discusses disparities in diabetes, the cultural differences that may influence these disparities, and the role of RDs and diabetes educators. 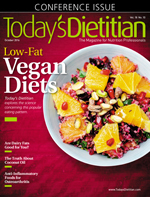 Today's Dietitian speaks with experts and explores the science concerning this popular plant-based eating pattern. In the debate about saturated fats, where does full-fat dairy fit? What's behind its "health halo," and does the latest science back it up? Learn about this program that provides nutrition for both ends of the life cycle. The dietitian behind the winner of the ABC reality TV show My Diet Is Better Than Yours discusses what sets her diet plan apart, how she makes career decisions, and why authenticity is the best card you have—so why not play it? Research shows a diet rich in anti-inflammatory compounds can prevent and even slow disease progression. This continuing education course explores whether there's scientific evidence for the efficacy and safety of detox diets for weight loss, examines the components of popular detox diets, and discusses potential adverse effects. 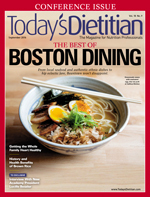 If you're heading to Boston next month for the Food & Nutrition Conference and Expo®, get ready to experience this city's dynamic food scene. From local seafood and farm-fresh produce to authentic ethnic eateries and hip, eclectic fare, Beantown won't disappoint. 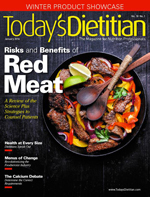 Dietitians provide their best tips for addressing the eating habits of the entire family to increase the odds of behavior change in individual patients with cardiovascular disease and decrease the risk of future disease in their children. Explore this staple's unique history, nutrient content, and varied health benefits. Today's Dietitian sits down with the new president of the Academy of Nutrition and Dietetics, who offers her best career advice and lays out her most ambitious aspirations for the organization. Research shows introducing peanut products in early infancy is efficacious in reducing risk of peanut allergy in children. This continuing education course identifies and examines current evidence about the role of nutrition in beauty. It explores the effect of dietary interventions and appropriate supplementation on reducing acne and wrinkles, managing skin dryness, and strengthening hair and nails. Research shows these eating patterns are effective in controlling blood glucose in some patients, but they may not work for everyone. Learn about its history, its benefits, and where it stands today. Fiber often triggers symptoms in patients with IBS, but it's also a commonly recommended treatment. Learn how patients can eat a fiber-rich diet without worsening GI distress. Consumers can enjoy them in meals, individually wrapped packages, and various snack foods. They offer good nutrition, variety, and health benefits. This continuing education course reviews the nutritional content of flax and explores its potential to assist in preventing and managing various medical conditions. Fruits and vegetables that feature that deep violet hue are loaded with antioxidants that studies show can improve cardiovascular disease risk factors. According to a survey of 450 dietitians who weighed in on the top nutrition trends of 2016, more consumers are gravitating toward plant-based protein sources to meet daily requirements. Today's Dietitian reviews the health benefits of green tea. Weight Loss Resistance — Myth or Harsh Reality? Learn about the possible explanations for why weight loss sometimes eludes clients' best efforts. With new product innovations on the market, clients can enjoy baked goods and other foods they once avoided. This year's symposium was TD's best continuing education and networking event yet. This continuing education course provides an overview of MI in nutrition counseling, offering readers essential tools for enhancing client motivation. Studies suggest a diet rich in antioxidants, phytochemicals, and B vitamins may promote cognitive function in senior patients. 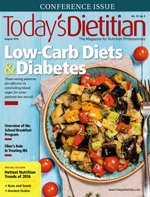 Today's Dietitian takes a deeper look at their differences in fatty acid composition. Learn about the duties RDs perform, the challenges they face, and the rewards they receive from working in the prison setting. 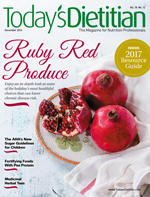 Nutrition professionals weigh in on this year's top nutrition trends, and clean eating is number one. Today's Dietitian explores the pros and cons of this move toward more whole foods and simpler ingredients and the companion trend of front-of-package "free-from" claims. This creamy fruit is in high demand among consumers due to its health benefits and culinary versatility. This continuing education course reviews the health benefits and culinary uses of edible sea vegetables and includes strategies clients can use to incorporate them into their diets. 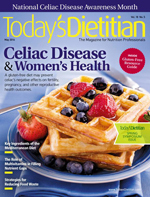 Research shows a link between celiac disease and its negative effects on female reproduction and suggests a gluten-free diet may help. Learn all about the health benefits and the different foods that characterize this nutritious eating pattern. Most Americans don't meet all their daily vitamin and mineral requirements through food and could improve their health by taking a multivitamin. Throwing away food that could feed the hungry worldwide is an astronomical problem, but there are strategies dietitians can practice and share with clients to help bring this to an end. 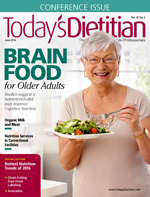 Evidence suggests proper nutrition may help alleviate the debilitating symptoms associated with this neurodegenerative condition. This continuing education course reviews the ketogenic diet, the medical conditions it's used to treat, and its mechanisms of action. 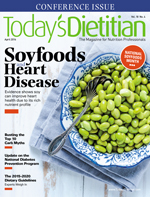 Evidence shows soyfoods can improve heart health due to their rich fatty acid, protein, and isoflavone content. Learn what the National DPP is all about and how dietitians can get involved. Today's Dietitian speaks with nutrition professionals to distinguish truth from error. Experts weigh in on the new guidelines and discuss how they could impact the health of Americans. As new health care models that include the expertise of dietitians continue to develop, more opportunities will become available for those who want to work in home health care. This continuing education course explores the physiological responses to stress and the effect of stress on weight management. Learn about their health benefits and creative ways to incorporate them into clients' favorite meals and snacks. Staying hydrated and fueling up with the right balance of carbs, protein, and fat is key to optimal performance. Retail RDs across the country are hosting creative food demos, cooking classes, and other innovative programs as they educate shoppers about health and wellness during National Nutrition Month®. 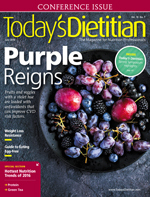 Today's Dietitian presents its seventh annual showcase of 10 RDs who are making a difference. Here's what dietitians need to know plus tips for counseling clients about this fast-growing yet controversial trend. This continuing education course explores premenstrual syndrome and the role genetics, environment, and diet may play in its onset. 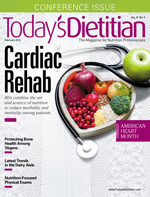 Dietitians working on the frontlines of cardiac patient care have the unique opportunity of combining the art and science of nutrition therapy. Research shows that consuming plenty of plant-based foods containing highly absorbable calcium and vitamin D is the key to optimal bone health. What's Trending in the Dairy Aisle? As fluid milk sales continue to wane, yogurt, kefir, and cottage cheese products gain in popularity. They're an underused but much-needed tool in the dietitian's toolbox to help identify more cases of malnutrition and improve patient outcomes. Today's Dietitian interviews five RDs to find out why they left their former professions and how they overcame challenges to embark on a successful journey the second time around. This continuing education course reviews the pathophysiology, symptoms, causes, and treatment for chronic pancreatitis. Today's Dietitian reviews the science on this American diet mainstay and offers advice on how to counsel clients. Learn what the experts say about this controversial dietary approach that focuses on healthful lifestyle behaviors—not weight loss—for optimal health. This foodservice initiative is encouraging collaboration among leaders of sustainability and environmental stewardship to offer healthful, sustainable food and food systems to the masses. Amid decades of research and inconsistent study results, dietitians can still counsel clients effectively about calcium intake recommendations. The Goldring Center for Culinary Medicine at Tulane University offers an unprecedented approach to teaching nutrition to medical students and physicians. This continuing education course explores the causes, associated conditions, and treatments under research for this complex GI disorder.